Over the last month, the brand which has achieved the greatest uplift in its Ad Awareness is Swedish furniture brand Ikea with its campaign based upon helping Brits ‘relax into greatness’. It features the story of a ‘Lion Man’ resting momentarily in a living room with the ad later showing that the lion is in fact a father in a costume for his child’s birthday party. The advert is part of the wider ‘Wonderful Everyday’ initiative the brand has pushed, which aims to show how its furniture can help people enjoy day-to-day activities. YouGov BrandIndex data highlights the cut-through the advert has had. 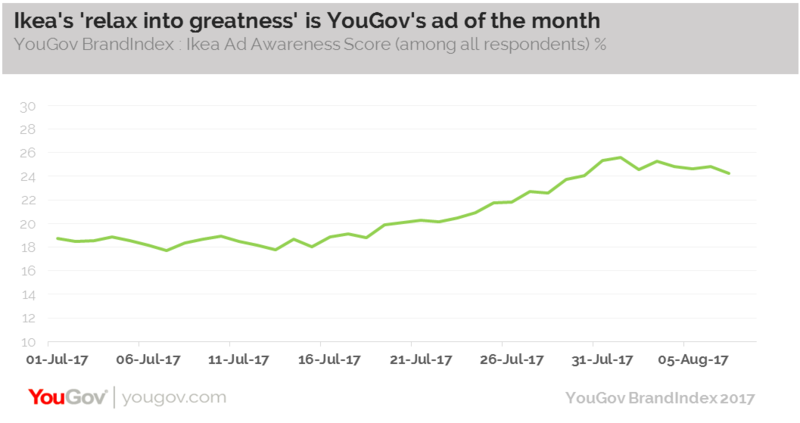 Ikea’s Ad Awareness score (which measures whether someone has seen the brand’s advert in the past two weeks) has risen by 7 points among all respondents, increasing from 18% to 25% between since the 16th July. Looking at just those that are already considering shopping at Ikea, the increase is even more striking – rising from 22% to 38%. What’s more, it appears as though the general public is hearing more positive things about the brand. Ikea’s Buzz score (whether someone has heard something positive about the brand) has also grown since the advert’s release, moving from +8 to +13. All this increased attention has impacted on the proportion of consumers that say they would consider buying something from Ikea. The brand’s Purchase Consideration score has also grown from +45 to +50 over the last few weeks. Of course, this advert is adding to the solid consumer perception the brand already had. Its traditional messaging has always been based on affordability and our data shows that such positioning still resonates with the public, despite the change in direction for this campaign. Looking at all the brands in our ‘General Retail’ category, Ikea is top when it comes to Value for Money (on a score of +42%, five points ahead of its nearest rival). This of course puts Ikea is a strong position for any future expansion aims, particularly if it decides to try to introduce smaller high-street stores.